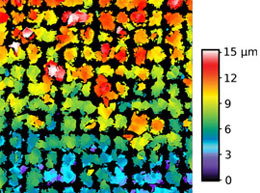 Cover image: This research image is a topographical height map of a compound semiconductor material called gallium phosphide (GaP) that is grown on a silicon (Si) microwire array. This semiconductor structure is designed to absorb sunlight and split water to generate solar fuels in a photoelectrochemical cell. Warmer colors represent higher regions of GaP, and cooler colors depict lower regions. The image width is 77 microns, and the rainbow color scale covers 15 microns in height. It was created by graduate student Andrew Leenheer, working with Professor Harry Atwater, as well as postdoctoral scholar Nicholas Strandwitz, working with Professor Nathan Lewis. The image was obtained using a confocal microscope. Above: Multi-university team working with Rob Summers. Designing Software to Make Extremely Dangerous Consequences Not Just "Unlikely" but "Impossible"
Inside back cover: The Jorgensen Laboratory, formerly the home of computer science in EAS, is being renovated to serve as the new home for two of Caltech’s key energy and sustainability research efforts: the Resnick Institute and the Joint Center for Artificial Photosynthesis. Large concrete overhangs have been removed to introduce more natural light and ventilation. Ninety percent of the materials from the interior demolition of the building are being reused or recycled. The goal for this laboratory-intensive building is LEED Gold Certification. 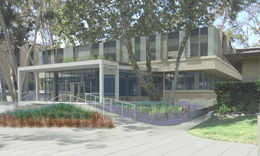 The architects, John Friedman and Alice Kimm, have incorporated many energy-efficient design features to embody the innovative research that will be conducted within. The Caltech Division of Engineering and Applied Science consists of seven Departments and is home to more than 75 faculty who form an interconnected web of researchers creating the frontiers of modern science and engineering. Their students and postdoctoral colleagues have access to world-renowned educational resources, as well as unparalleled opportunities for both basic and applied research. pg. 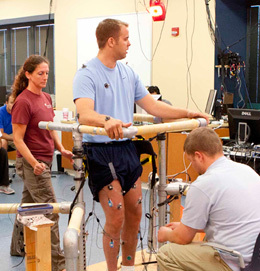 20: Implanted electrode array—The Lancet; Electrical leads implanted in the paraplegic patient—Medtronic, Inc.